Ticket buyers will be contacted with instructions on how to receive refunds. They are about to hit Shenzhen! JESSIE J is an English singer and songwriter. Born and raised in London, she began her career on stage, aged 11, with a role in the West End musical Whistle Down the Wind. She studied at the BRIT School before signing with Gut Records and striking a songwriting deal with Sony/ATV Music Publishing. After signing with Universal Republic, Jessie J came to prominence following the release of her debut single "Do It Like a Dude". Her next song "Price Tag" topped the charts in nineteen countries including the UK and was followed by the release of her debut album Who You Are (2011), which charted at number two in the UK. In 2012, Jessie J performed at the Queen's Diamond Jubilee Concert outside Buckingham Palace in June, as well as the closing ceremony of the 2012 Olympic Games in London on 12 August. Her second album Alive (2013) reached the top 5 in the UK Albums Chart and also included the top-five hit songs "Wild" and "It's My Party". The release of her third album Sweet Talker (2014) was preceded by the single "Bang Bang" which debuted at number one in the UK and went multi-platinum worldwide. FLO RIDA, is an American rapper, singer and songwriter from Carol City, Florida. His 2008 breakout single "Low" was number one for 10 weeks in the United States and broke the record for digital download sales at the time of its release. Flo Rida's debut studio album, 2008's Mail on Sunday, reached number four in the US. The album was succeeded by R.O.O.T.S., the next year. His subsequent albums, 2010's Only One Flo (Part 1) and 2012's Wild Ones, also charted on the US Billboard 200 chart. Flo Rida has sold over 80 million digital downloads, making him one of the best-selling music artists. His catalog includes the international singles "Right Round", "Club Can't Handle Me", "Good Feeling", "Wild Ones", "Whistle", "I Cry", "G.D.F.R. ", and "My House". Now! Right now! 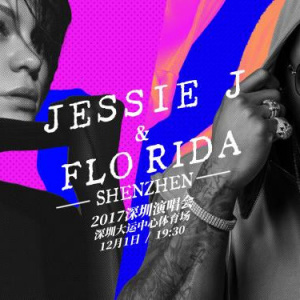 Jessie J & Flo Rida 2017 concert! December 1, 2017, in Shenzhen Universiade Sports Center Stadium. Waiting for you! Upon purchase, tickets will be sent to your chosen address within 3 working days. Free of postal charge. Red Dragon Entertainment has 15 years overseas live concerts and event planning experience, Red Dragon is devoted to introduce famous international artists and planning world-class music concerts.Red Dragon is working on cross-border integration of entertainment resources, actively using good cooperation to enlarge China's growing entertainment market , so as to boost the development of China's cultural industry . Customers who purchase VIP tickets,please pick up the package at the VIP package temporary office on the center square of the venue.